» VeganMoFo: The Addams Family Don’t Eat Off The Sidewalk! Who is the most awesome tv/movie family of all time? If you think it’s The Brady Bunch, please go have sexual relations with yourself. If you said The Munsters, okay, but they aren’t as popular as The Addams. 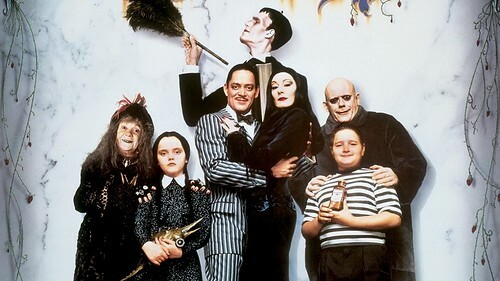 Did you know that The Addams Family started as a comic strip, and none of them even had names until the tv show? For a brief history of all things Addams, go here. While I think the first movie is awesome, I think the sequel is even better so let’s jump to that! In the second movie, Morticia and Gomez welcome a new baby, Pubert. How those two don’t have 18 kids and counting i’ll never know, because one of the running themes of the tv show and the movie is that they’re constantly making bedroom eyes at each other. So they hire a nanny, who (spoiler alert) is evil, and convinces the parents to ship Wednesday and Pugsley off to summer camp, which is the BEST part of the movie. They could scrap everything else and turn it into a short called ‘Wednesday and Pugsley Go To Camp Chippewa” and that would be just fine. Then some other stuff happens and what it boils down to is that this family loves each other a lot and it’s very heartwarming and blah di dah. This is a ‘who isn’t in this movie’, so i’ll just point out a few: Mercedes McNab (Hatchet, Buffy/Angel) is the annoying blonde girl at camp, David Krumholtz (Numb3rs, Harold and Kumar, Serenity) plays the nerdy love interest of Wednesday, and John Franklin (Issac from Children of the Corn) plays Cousin Itt. 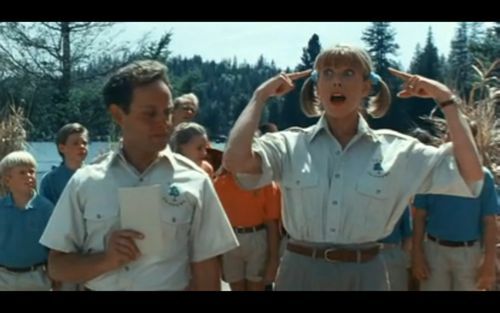 And of course, Peter MacNicol (Ally McBeal, Numb3rs, 24, Ghostbusters II) and Christine Baranski (The Good Wife, Mama Mia, Sheldon’s mom on Big Bang Theory) are amazing as the directors of Camp Chippewa. For the menu, I went with black and white foods, with a spicy kick to represent the burning passion between Morticia and Gomez. If you want you can just drink lemonade and make vegan girl scout cookies, there is a recipe for Thin Mints in The Vegan Cookie Connoisseur and a recipe for Samoas in Vegan Cookies Invade Your Cookie Jar.